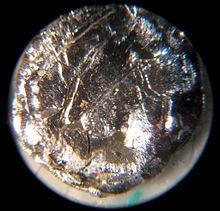 Americium is a radioactive transuranic chemical element wi seembol Am an atomic nummer 95. ↑ Muller, W.; Schenkel, R.; Schmidt, H. E.; Spirlet, J. C.; McElroy, D. L.; Hall, R. O. A.; Mortimer, M. J. (1978). "The electrical resistivity and specific heat of americium metal". Journal of Low Temperature Physics. 30 (5–6): 561. Bibcode:1978JLTP...30..561M. doi:10.1007/BF00116197. This page wis last eeditit on 13 Dizember 2015, at 00:45.